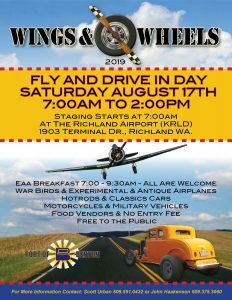 Please extend to all of your membership this invitation to spend Saturday, August 17, 2019 with us at the 3rd Annual Wings and Wheels at Richland Airport (KRLD), Richland, Washington, hosted once again by The Port of Benton. We are spreading the word to over 100 organizations from Washington, Oregon, Idaho, Montana and British Columbia and after an turnout of nearly 2,000 at our 2018 event, we expect this years’ event to be even bigger. Once again, admission to the public and participants is FREE and entry of aircraft and vehicles for judging is FREE. With military vehicles and warbirds, vintage cars and trucks, antique aircraft, modern show machines, motorcycles, hot rods and experimental aircraft we expect there to be something for everyone to appreciate. EAA Chapter 391 will be hosting a pancake breakfast from 7:00 to 9:30, and multiple food trucks and vendors will be on location for the remainder of the event. Hope to see you there! At 1:00 PM Tuesday Dec 4th we will be having a “cleaning/decorating” get together at the EAA 31 Hangar/Clubhouse prior to the Christmas party on the 5th. We will be steam moping the floor and doing some decorating. Anyone with a talent for either is welcome to join. If we have enough help we should be done in 90 minutes. Chapter 31; Randy Stout 10 flights for 10 Young Eagles. (If he had a 172 it would have been 30 kids!). Ray Morse 7 flights for 18 Young eagles. Bill Dewey 6 flights for 17 Young Eagles. Jim Origliosso 5 flights for 15 young Eagles. Gary Ludeke 2 flights for 2 Young Eagles. David Cole 1 flight for 3 Young Eagles. Chapter 1524: Richard Key 5 flights for 5 Young Eagles. Gary Burroughs 1 flight for 3 Young Eagles. Greg Burrows 1 flight for 2 Young Eagles. Chapter 1457: Alan Wieder 2 flights for 2 Young Eagles. Bruce Gustafson 2 flights for 2 Young Eagles. Many thanks for all who flew and all the hard work on the ground. There was a ton of prep and tear down both inside and out and everybody pitched in. Many Many thanks to all. We had a lot of smiles on a lot of kids, some of which are likely to become pilots. A successful day. Thanks again. Wear your Young Eagle Tee Shirts. If you do not already have same, pick one up from the storage closet and put $5 to $8 bucks in the kitty. Bring unneeded Kit Planes and Sport Aviation magazines so we can add a label and give them away. Big Bites (same vendor as last year) will be on hand for eats, treats and drinks. HooRay HooRah; EAA 31 got our water supply back at 3:30 PM today. Final pressure adjustments and leak detection complete. A definite relief. Just in time for tomorrow’s (Tuesday July 3rd) preparations for Young Eagles on the 4th. Clean the floor, tables, chairs etc. Set up the computer station to print YE certificates and Pilot info for the consent forms. Set up the temporary crowd control fencing. Other stuff I haven’t yet thought of. Please point out anything we’re missing. We’ll start at 9:00 AM and work until we are done or until we reach all we can do before the 4th. You could bring Kitplane and Sport Aviation copies for promotional give away.